Despite being on the most proficient properties on television, video game developers have had a difficult time producing a Game of Thrones title that’s up to snuff with the HBO series. Telltale tried, Cyanide tried, Warner Bros. tried, yet nothing has been able to match the majesty and scope of the show. Now, Nerial is taking a shot with Reigns: Game of Thrones, and while it’s the best Game of Thrones game by default, it’s also the best showcase of the Reigns formula to date. Reigns: Game of Thrones casts players in the role of the Red Priestess Melisandre as she looks into the fire asking R’hilor, the Lord of Light, to show her who is the true heir to the Iron Throne. Starting with Daenerys Targaryen, players can rule over Westeros in a series of “What if?” situations by swiping left or right with each prompt they’re given. She’s only in power for a moment, for the tutorial actually, before we’re given control of Tyrion Lannister and set out to unlock the remaining possible rulers. There are a few Starks, two additional Lannisters, and two bastards who all have a claim to the throne. After each of the possible candidates is unlocked, the real challenge of the game begins: survive winter. Beating the game means destroying the White Walkers with each of the potential rulers, and each character will take their own unique path to do so. Some will call upon their dragons, others walk a darker trail. Surviving winter isn’t easy and neither is reaching the season in the first place as every decision you make could lead to your doom. 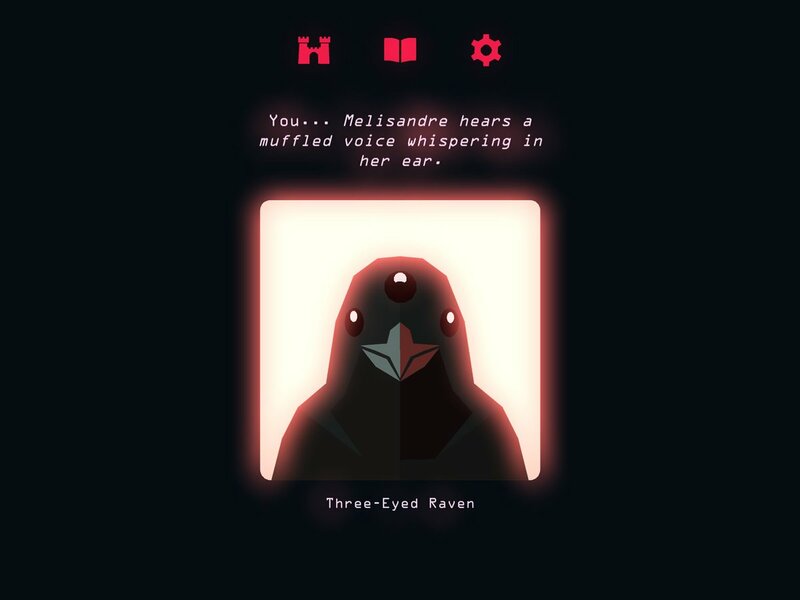 The Reigns gameplay formula boils monarchical decisions down to what is basically Tinder. Swipe left or right to make a decision when prompted, choosing what you think is the most prudent option to keep your reign going as many moons as possible. Successfully ruling means striking a balance between being loved and hated, rich and in debt, pious and sacrilegious, and powerful and meek. Grow too strong or too weak in one area and it’s curtains for you. Some decisions will take the stress off certain areas, such as when Winterfell announces they have your back no matter how weak in power you become, but other decisions might hamper your ability to make impactful decrees. There are a great many different paths you can lead each character down, including engaging in mini-games like jousting, a guessing game, or war with another kingdom. These types of distractions are all well and good, but they can’t mask the fact Reigns: Game of Thrones has a distinct lack of variety. There are well over 1,000 cards to swipe in this game, which sounds like a lot but really isn’t when they repeat early and often. While the beginning of each character’s reign can change every time you start a new run, the feeling of déjà vu kicks in quickly as you’re prompted with the same selection of situations you’ve gone through a dozen times before. Bribes are always the same, tavern conversations are always the same, and most decisions you have to make repeat with each of the different rulers, sometimes more than once during a single reign. Not only does this level of repetition feel punishing when playing for long periods of time, but it also restricts the game from establishing a stronger, more cohesive narrative; though I suppose that’s more a byproduct of the Reigns conceit than any decision made with this particular game. It isn’t until you unlock the ability to actually survive winter, to be given the hint on how each character will guide their kingdom to the summer, that the engaging puzzle aspect of Reigns: GoT emerges. There are challenges, or Royal Deeds, to complete but for me, this game is at its most fun when I’m given a clue on how I defeat the White Walkers and then I have to figure out how to get to there from where my reign starts out. Reigns: Game of Thrones doesn’t reinvent the Reigns formula but it certainly gets more out of it than either of the last two games. With clever writing and a deductive approach to ruling from the Iron Throne, it’s a great way to revisit the world of Westeros as we await the final season of the show. Just don’t stay around for too long or you might find yourself growing bored fighting against the Dornishmen for the umpteenth time.